Lovelies are you enjoying the bank holiday weekend? Meeee too! I’ve been on an extended break down in Devon and have now travelled oop North to visit my family. 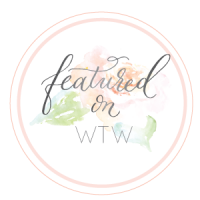 It’s been really lovely to have my first proper break from WTW in more than 2 years… Yes, WTW has now been running for a whole 2 years! Can you believe it? 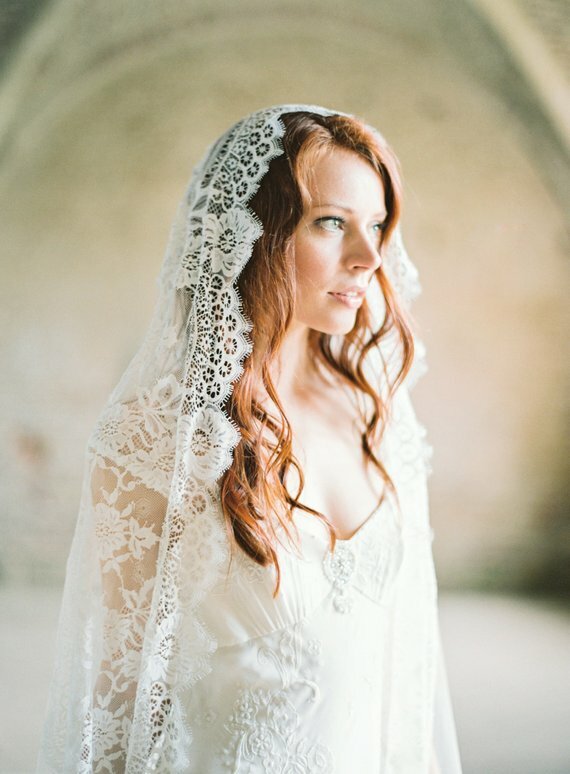 It’s been such a pleasure to share WTW with future brides. 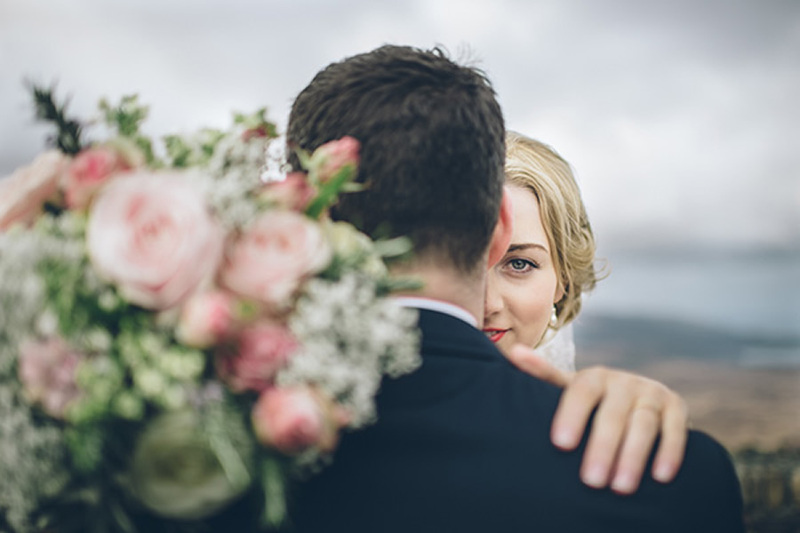 I love coming up with creative ideas and inspiration for how to style your big day, and nothing makes me happier than receiving emails from brides who followed the blog and want to share their big day with me. 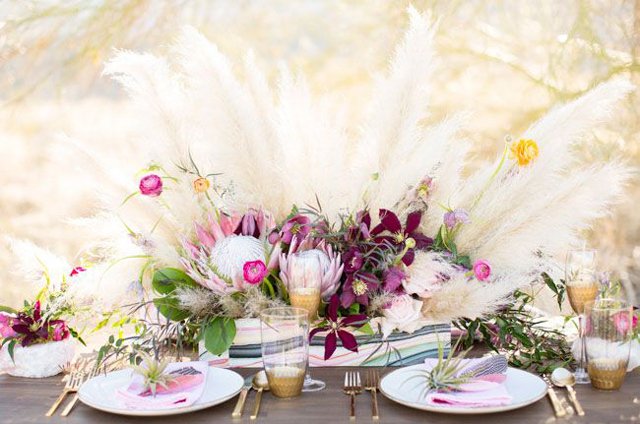 The styling possibilities for your wedding day are truly endless, and one area where you can be as creative as you like are your wedding tables. 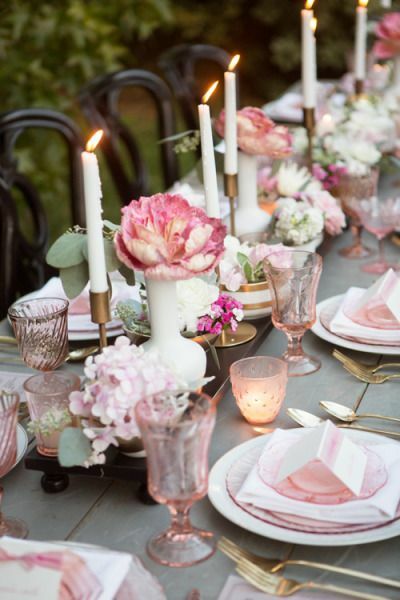 Pretty tablescapes are a beautiful way to incorporate your styling ideas and can go as far as breaking the ice for your guests [great talking point]. 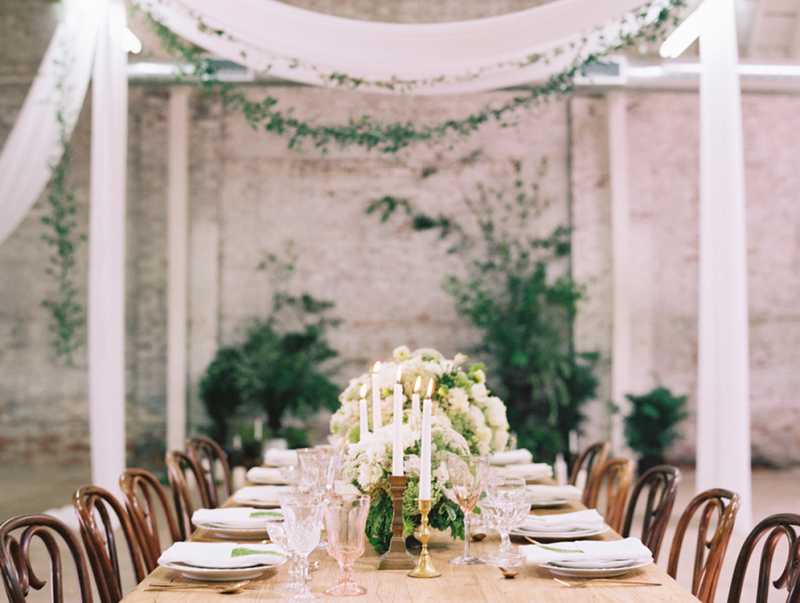 So I’ve been having a little nose around the web and today I’m sharing with you my top wedding table styling ideas. 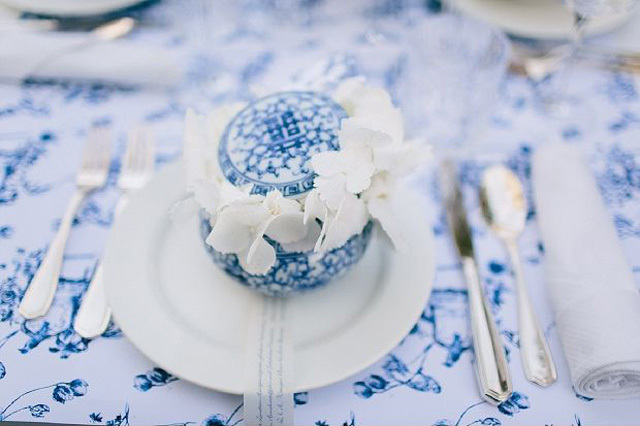 From beautiful centrepieces to amazing crockery, here are 30 ideas for your big day. 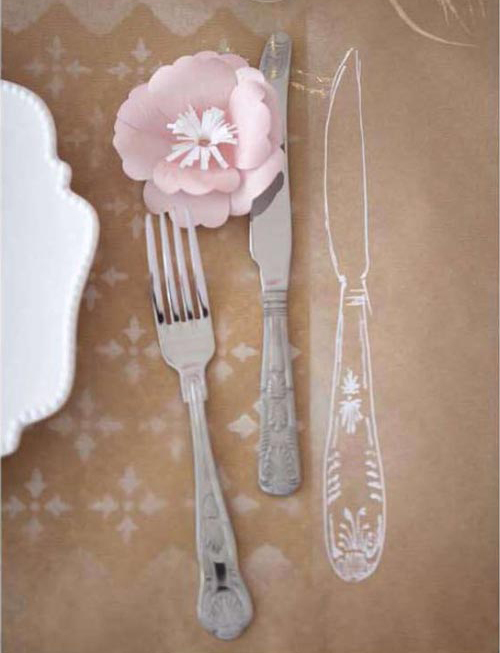 I adore these paper place mats with their rustic crockery illustrations! 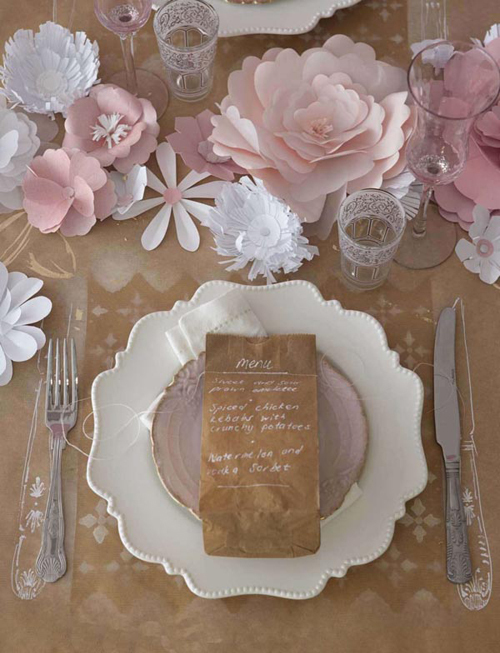 If you fancy a creative wedding project how about lining your tables with brown craft paper and stencilling on a pretty pattern? Click the link for the full DIY. For a brighter, more in your face idea grab a white table cloth, some cardboard boxes and a can of fluorescent spray paint! 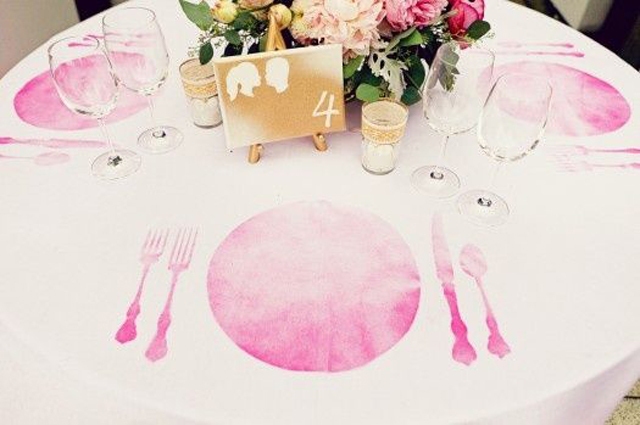 Make your stencils from the cardboard and lightly mist the spray paint in the desired place setting areas. 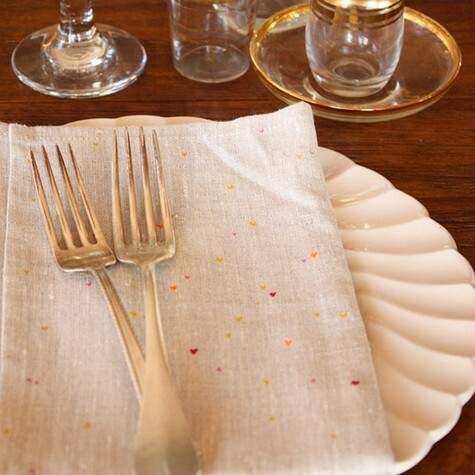 A simple idea for jazzing up your place settings could be to buy some lovely linen! 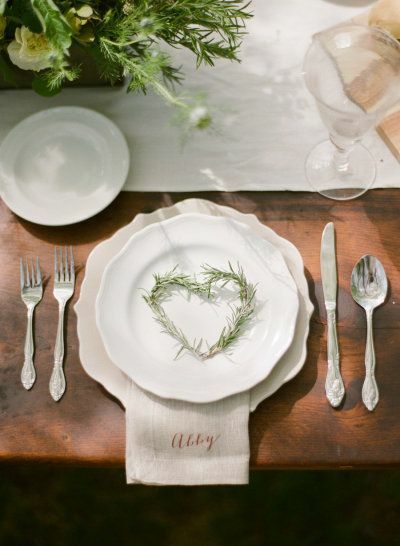 Loving the napkins with the small hearts on below. 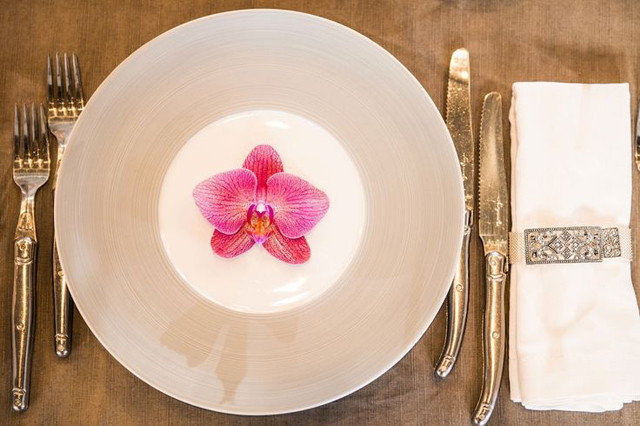 And obvious way to make a statement with your table settings is to hire or buy unique crockery. 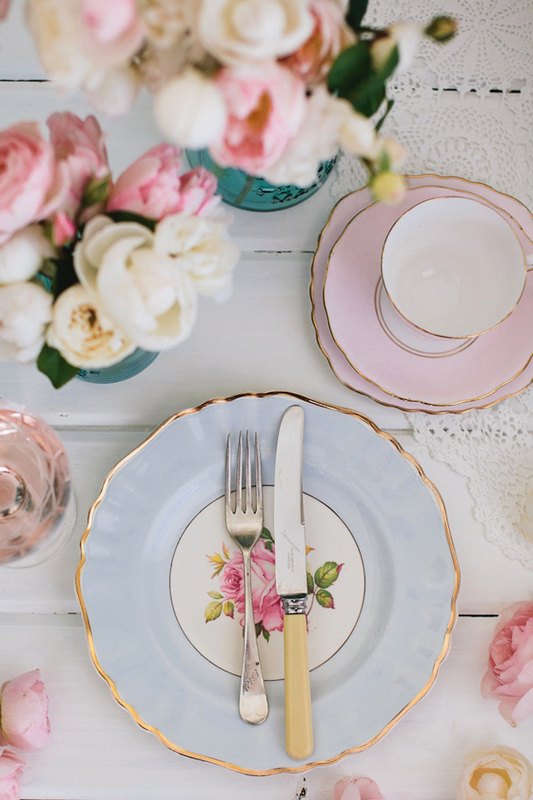 The pastel pinks and blues of this vintage crockery set are just gorgeous! 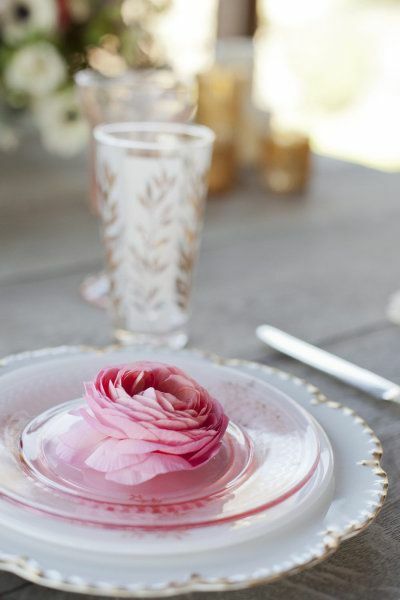 I’m totally obsessed with pink depression glass too! 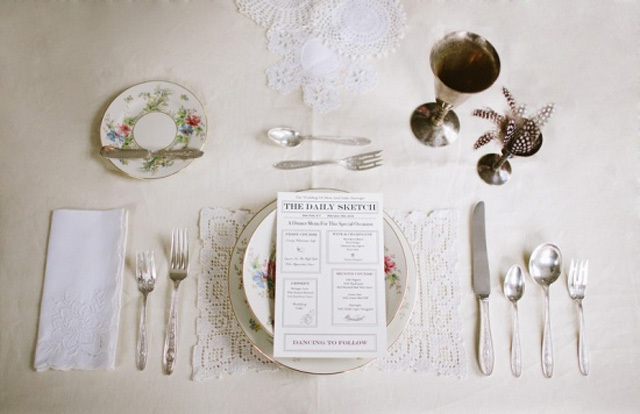 Look how amazingly beautiful this place setting is with the statement floral centrepiece, the gorgeous vintage crockery, cutlery and beautiful glassware. 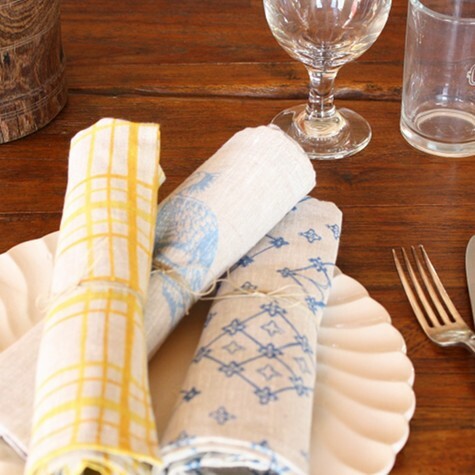 Other ways to add style to your tables is to cover them in cloths. 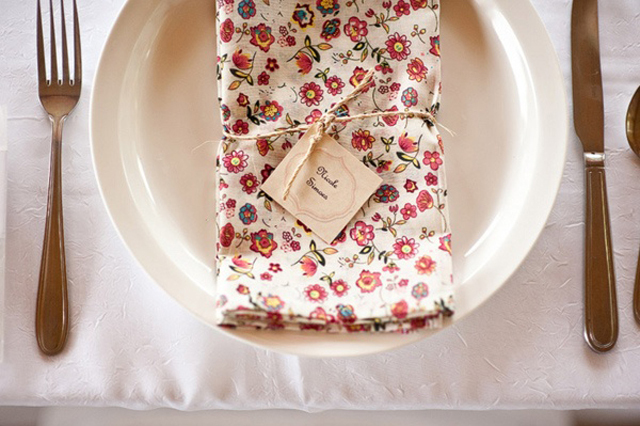 This toile de jour cover just screams French vintage chic. 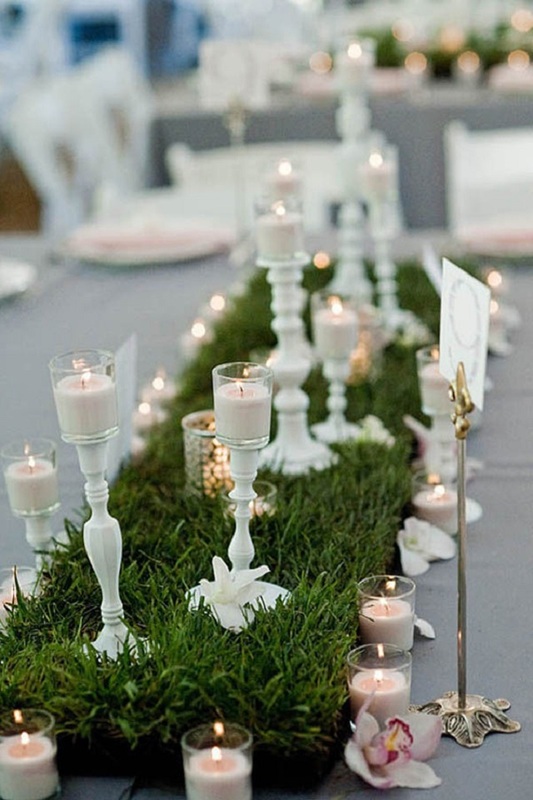 Can’t afford to cover all your tables? 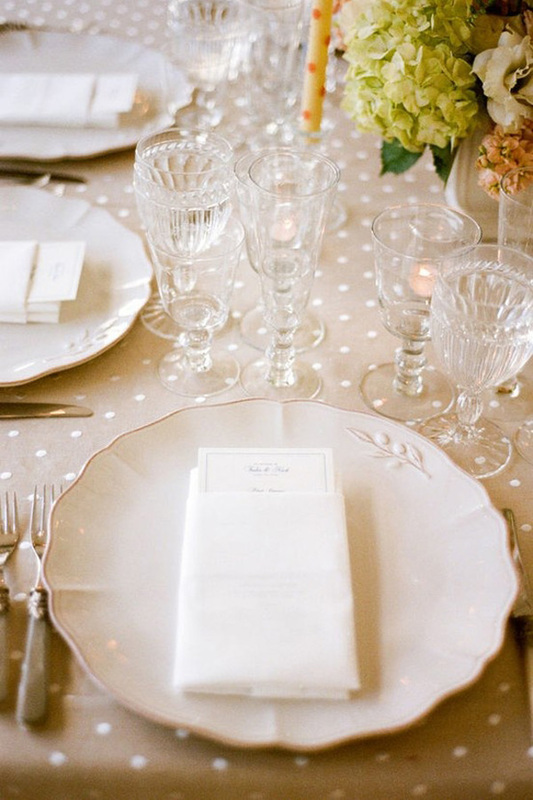 Decorate your top table with a gold sequined cloth… or maybe a pretty polka dot covering? 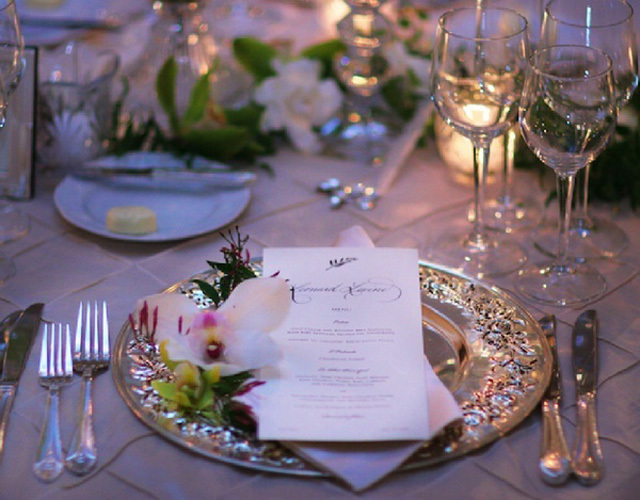 A rather ornate way to add sophisticated glamour could be to use charger plates. 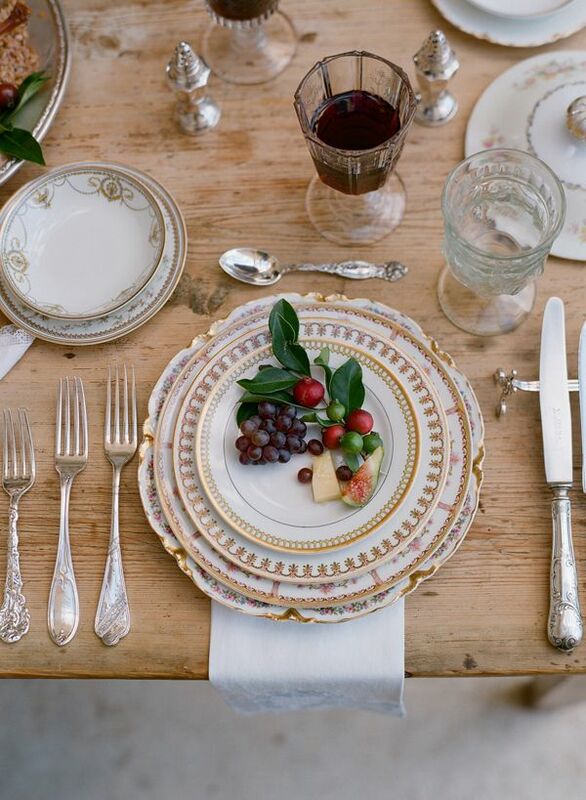 I love this antique style silver charger. Ultra posh! It’s amazing what a simple single bloom can do. 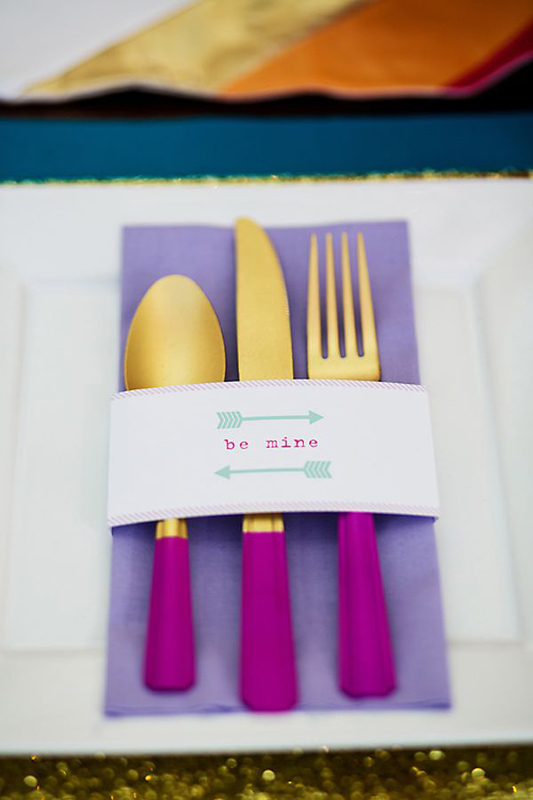 This one immediately brightens up the place setting. 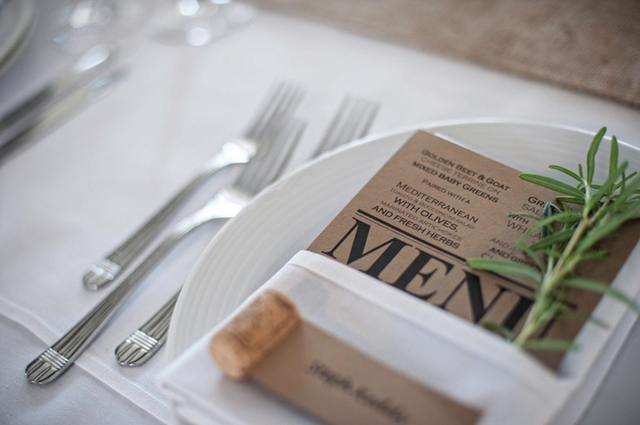 When your guests are seated, give them something to talk about and salivate over with this stylish printed menu. 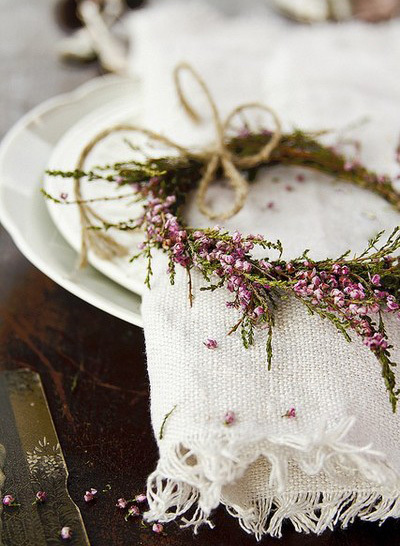 The sprig of rosemary is such a great idea and adds an extra dimension to their senses. 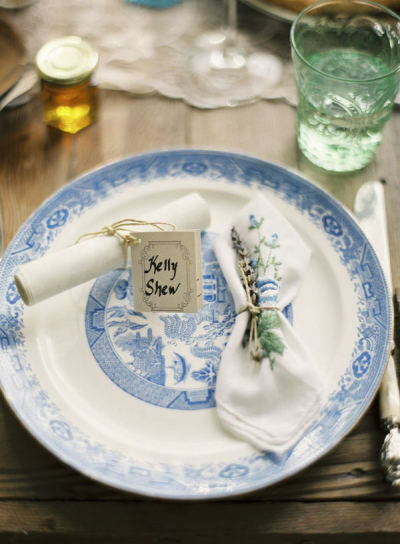 Here are a few cute ideas to decorate your plates. 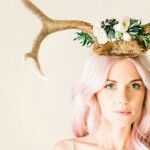 The geometric shapes are very modern and easy to DIY, as is the lace crown. 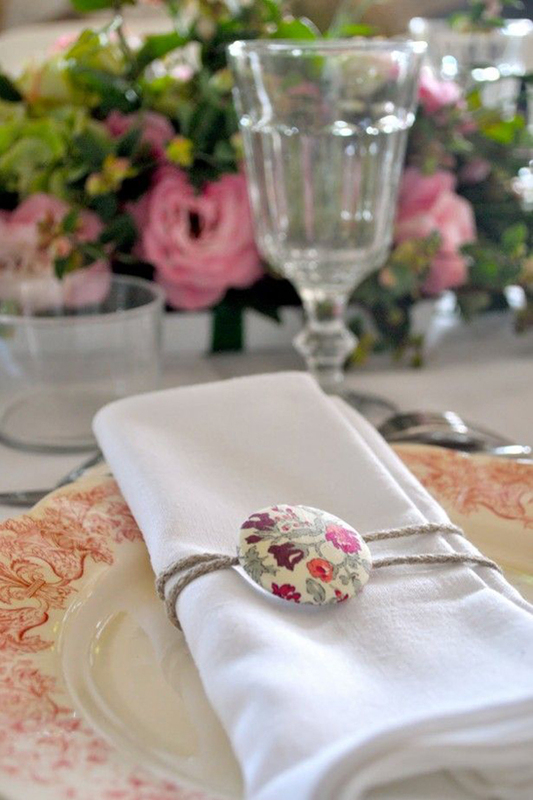 The cute floral buttons are also cute as a, err.. button! 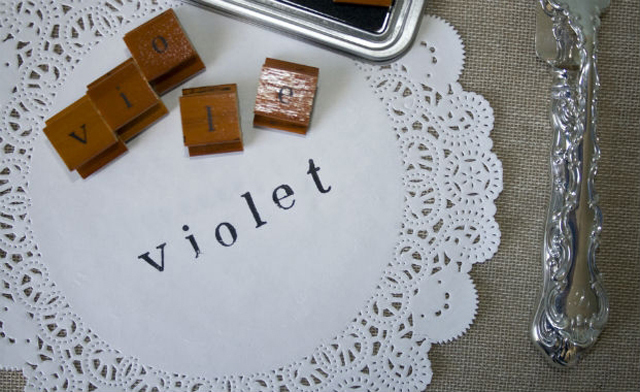 Personalise place setting with these cute doilies and handmade stamps from NOTHS. 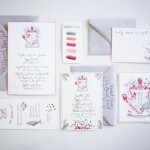 Give each of your guests a wedding favour in a pretty muslin or linen bag. 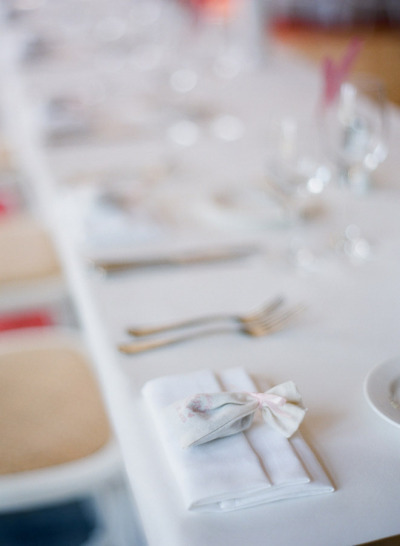 Or have your menu printed on a scroll. 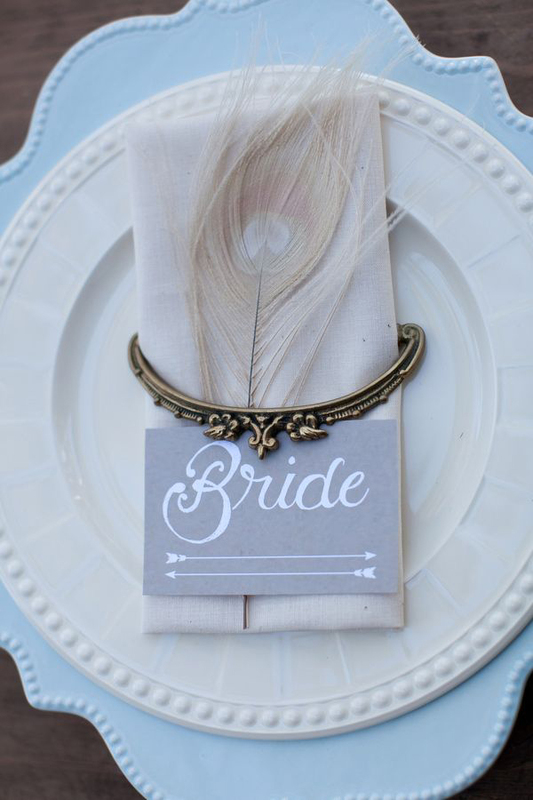 Another menu / favour idea. 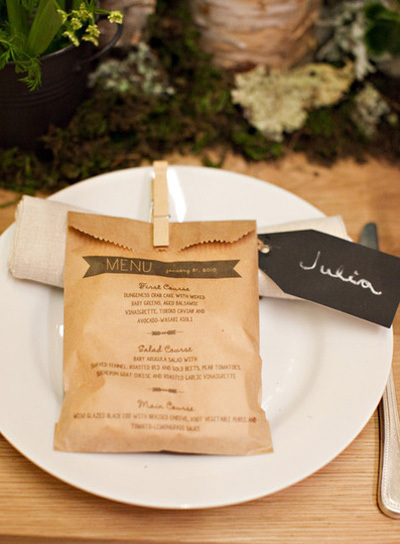 Use a brown paper bags to print your menu and then fill each bag with sweets for an easy favour idea. 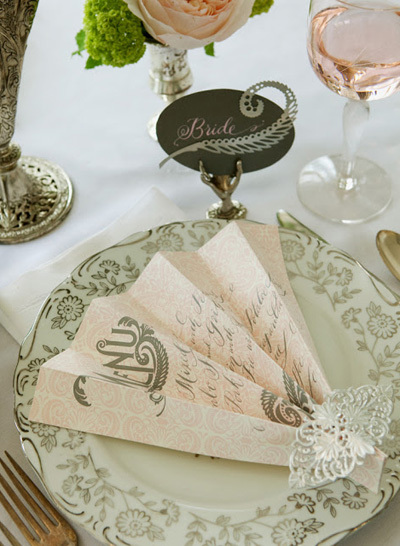 The concertina paper fan below with the gorgeous calligraphy also makes a pretty menu for your guests. 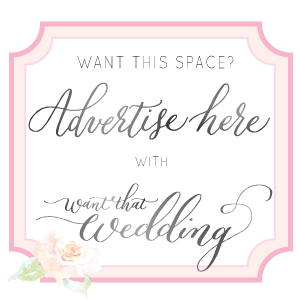 Print your menus in the form of a flyers, like the daily sketch below. 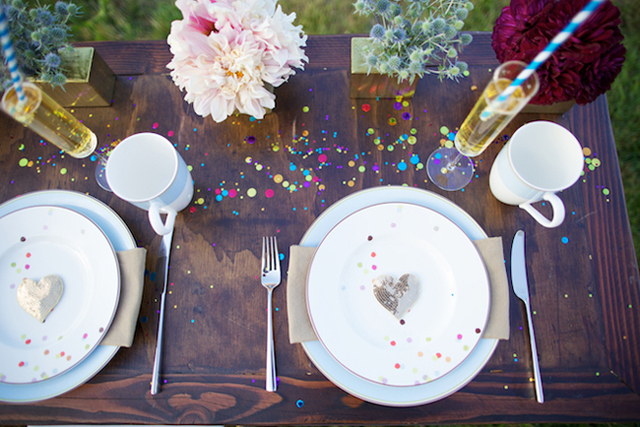 I really love colourful table confetti in assorted sizes and these sequined hearts. 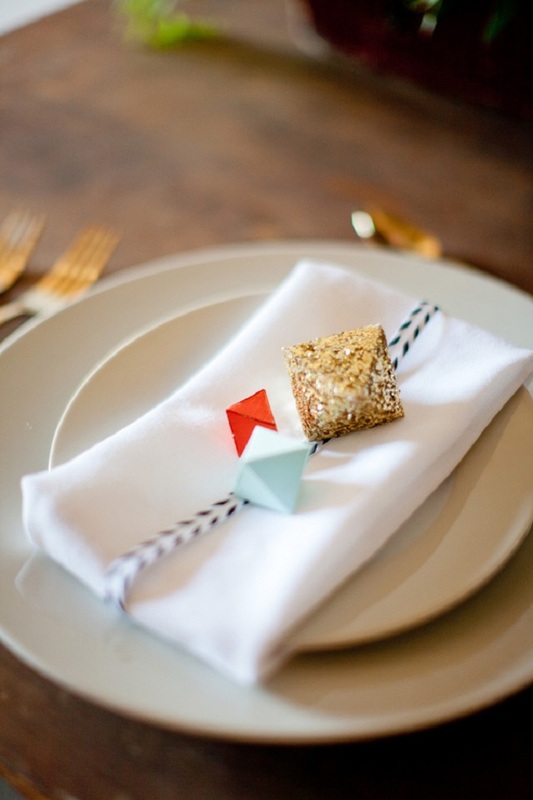 These modern napkin sleeves are pretty fab too! If you want to make an über statement. 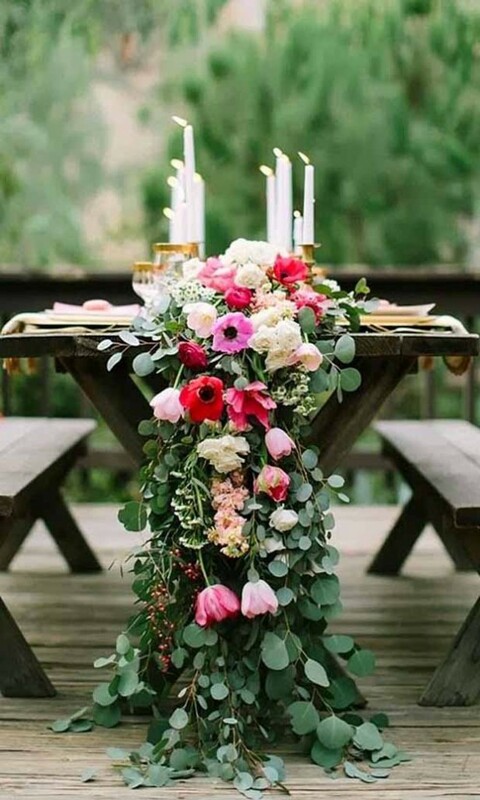 How about a huge centrepiece display like the one below? 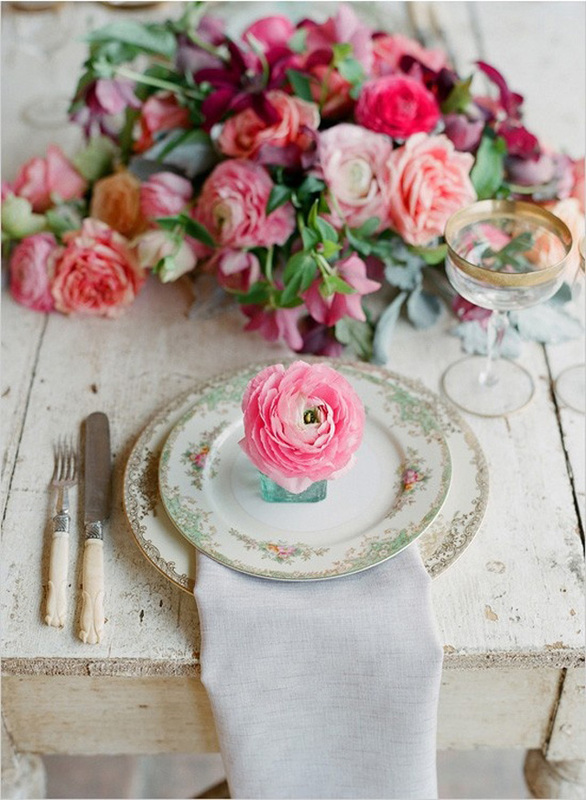 Bring your table to live with a living centrepiece! This grass runner is awesome! 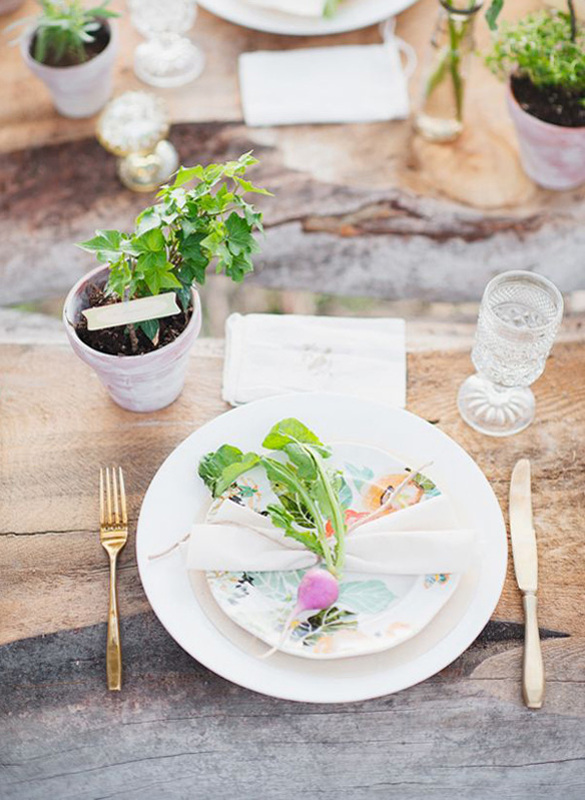 Staying with nature, you could choose vegetables or fruit to decorate your plates. Yes, really! 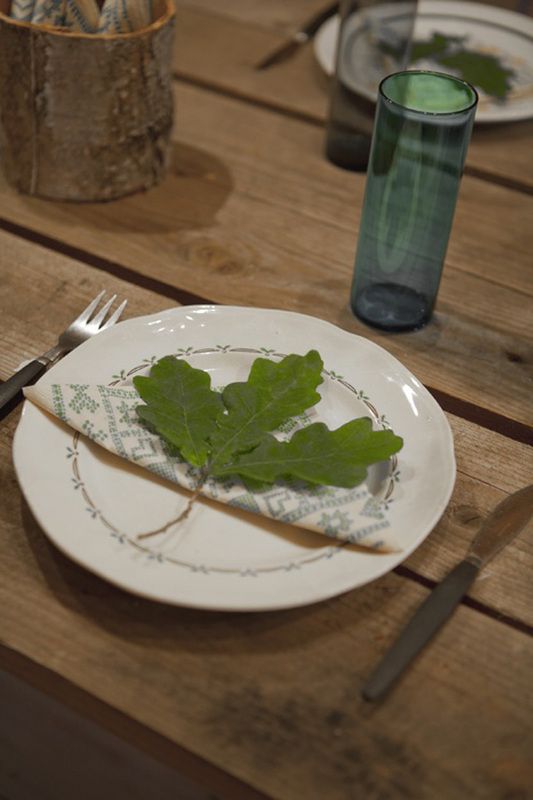 Another simple and rustic idea could be to collect leaves to decorate your plates. 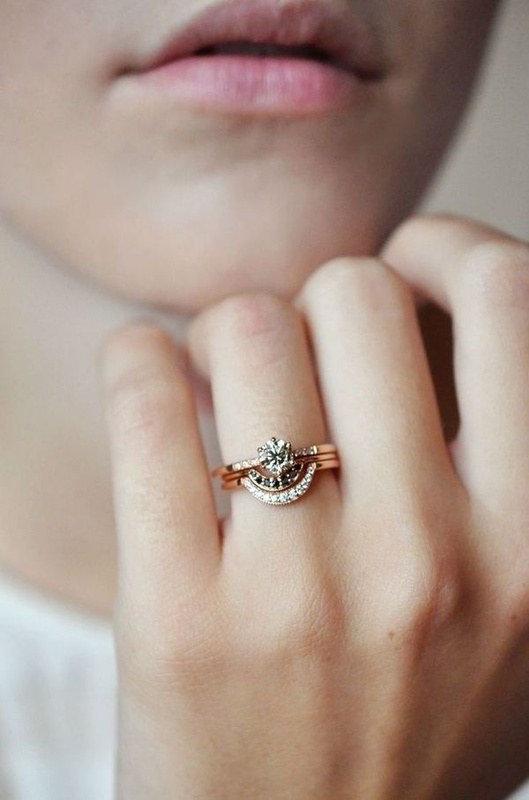 Want to make them bling? Spray them GOLD! 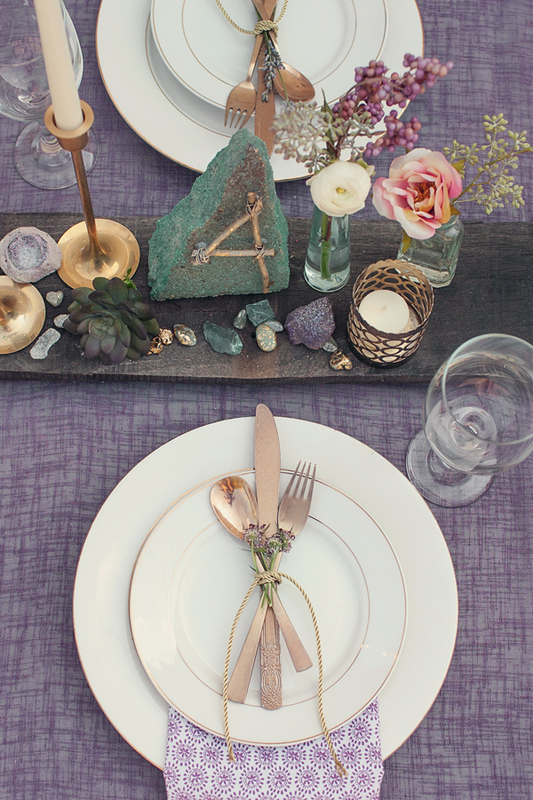 For an unusual centrepiece you could use pretty rocks like the table setting below. 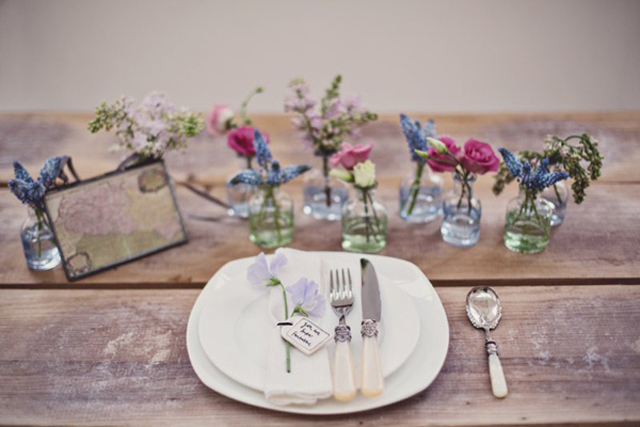 These tiny bottles make sweet table decorations. 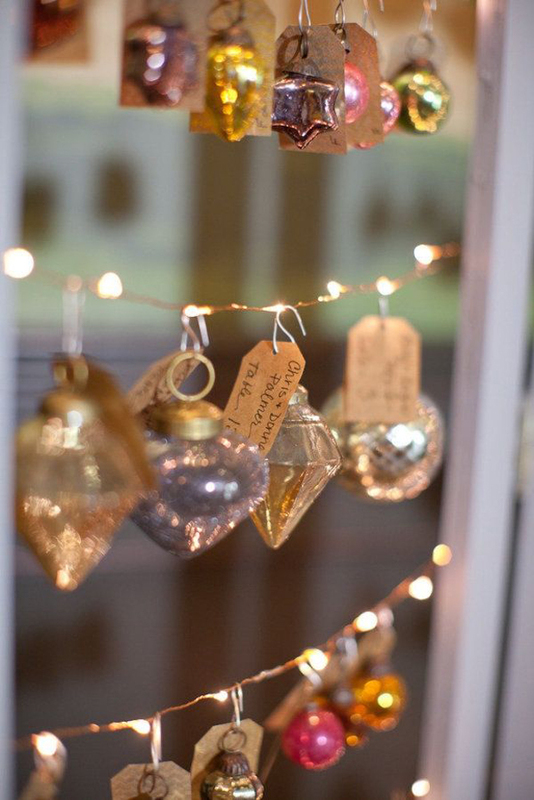 As do these lovely wreaths! 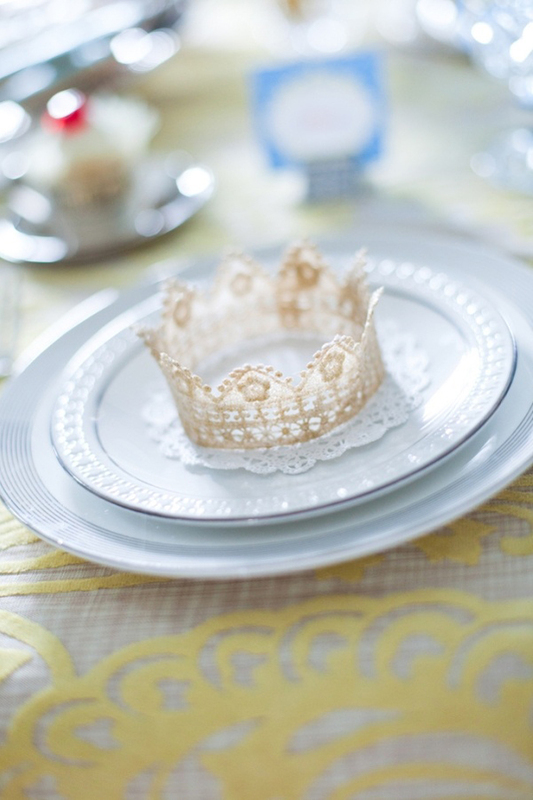 So I hope I’ve given you tons of fab table styling ideas! Which one are your faves? It’s a toughie! 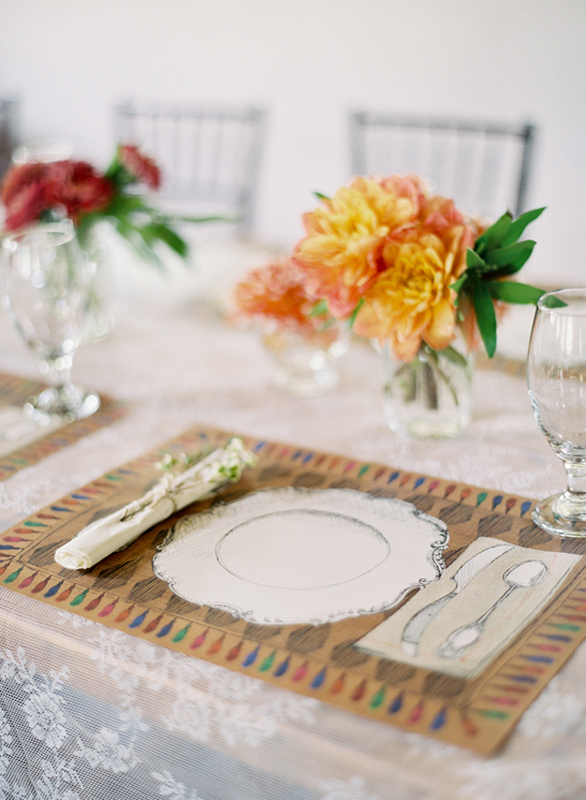 Gorgeous plate settings! 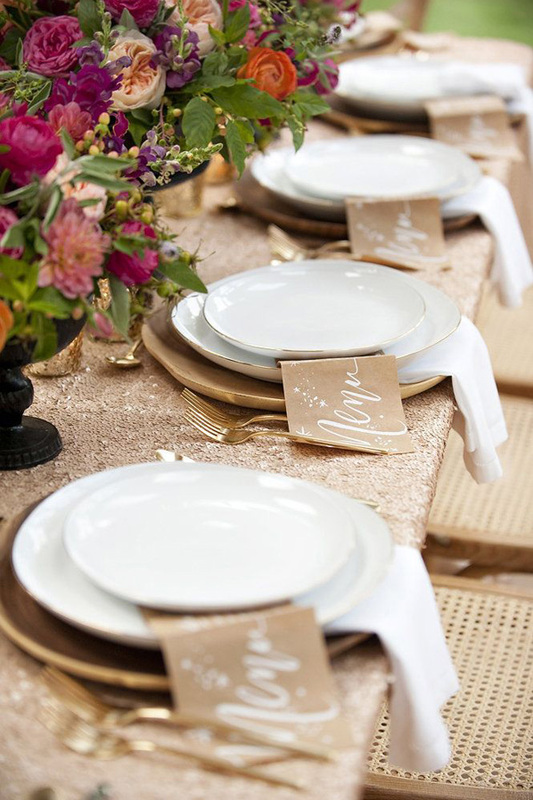 The colour confetti table is so simple but it has such an impact on the overall look of the table.